Hearts boss Gary Locke will meet the club's new owner Ann Budge early next week as he seeks to clarify his future. 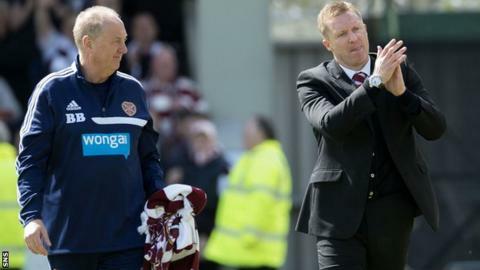 The 38-year-old is out of contract this summer, with Budge having agreed a deal to take Hearts out of administration. Insolvency led to a 15-point deduction at the start of the season, which ultimately led to relegation to the Championship. "Whether I'm due another chance is for the new owner and other people to decide," said Locke. "Ann will have her plans in place and know what she wants to do. Once I hear what she has to stay we'll take things on from there. "I wouldn't rule anything out. We'll have a clearer picture next week. "I don't need to tell anybody what the club means to me." Locke's side concluded their season with a 1-1 draw at St Mirren Park, Dale Carrick cancelling out Conor Newton's opener for the Buddies. "I'm really pleased that we could get a favourable result for our fans," Locke added. "Their backing all season's been nothing short of incredible and you can see today that the top flight will miss us. "The great thing from my point of view is, without the points deduction, we would've stayed in the league, and I think that speaks volumes for the effort the players have put in here all season. "It'll be difficult next year but with the way the players have played in the second half of this season, we'll give ourselves a great chance."